If I were to think of one phrase that makes me roll my eyes, cringe, or even laugh, it would be ‘best practice’. It’s such an HR cliché, and something that people just throw into a conversation or direction to give it some more umph. At the end of the day there are some flaws with ‘best practices.’ First, they are usually specific to an industry (and rarely disclosed). Secondly, it is usually unknown who has deemed it a ‘best practice.’ Was it a dinosaur who has liked something a certain way for a long time, and solved the issues of the 1980’s? I’m just saying. Next, ‘best’ is not equal to ‘always’ which is a common mistake of practitioners. If you think about it, how many times there is a unique situation and people (maybe even yourself) have tried to cram in a situation to fit a ‘best practice,’ and was it really the best? Lastly, ‘best’ also insinuates never needing revision, innovation, or challenge, which makes is mediocre. 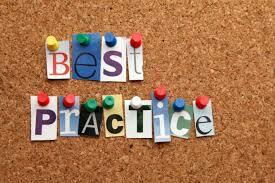 Don’t get me wrong, I use the term ‘best practice’ but specific to an outcome. For example, when a manager sent out an amazing PowerPoint slide deck announcing someone moving overseas for an internal job. But I said the same thing when another manager created a tumbler countdown for theirs! It wasn’t the tool, but the outcome or intention. In HR so few times do we ask why something is a ‘best practice’ or what obstacle it solves. Usually it seems obvious, but than that’s not a ‘best practice’ its just common sense. I challenge us, HR professionals, to undertake what it means for something to be a ‘best practice’ and sometimes its just a really good solution at your company for your culture and lastly your outcome. Becton, Bret J., and Mike Schraeder. 2009. “Strategic Human Resources Management.” Journal For Quality & Participation31, no. 4: 11-18. Business Source Premier, EBSCOhost (accessed February 10, 2014).